I have to give props to this blog for my bakinspiration of the day! Even though this is soy, the combination of flavors sound like they would complement each other really well. But as I am a baking creator, I cannot settle with any recipe. Instead about twenty minutes of thought and another twenty minutes of mixing random ingredients in a bowl will create some mysterious concoction that will usually (though sometimes not) dazzle the senses. 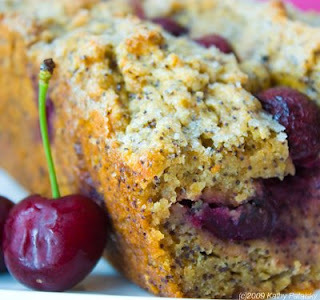 So here is my twist to the Lunch Box Bunch's Sweet Cherry Orange Peel Poppy Seed Bread. My new recipe has slightly less words in the title so you won't have to worry about trying to remember what you called it. I created a vegan recipe and a not so vegan recipe. I prefer to harden my arteries with real butter and eggs. I think my cholesterol can be sacrificed for the better taste of real ingredients. No offense to vegans as I do admire their creativity with the plant syrups, soy products and strange gums of the world, and their kindness to the environment and the creatures that we share it with. ~I like the combination of herbs and earthy flavors in baked goods. This recipe may sound strange and it can be quite difficult to make, but if you find yourself in need of something to fill the time, this I am sure will be quite delicious. A good hour before making the bread, you will need to prepare the milk. Slowly bring the soy milk and the tea bags to a light boil. Remove from heat and let the tea bags steep in the milk for quite a while. This allows the essence of the tea to infuse into the bread without all of the herbs. Let cool for about an hour. When ready to make the bread preheat oven to 350 degrees. Combine soy milk, oil, agave syrup, sugar, poppy seeds, vanilla extract in a large bowl. In a separate bowl, combine flour, baking powder, xantham gum, salt, and cinnamon. Stir dry ingredients into liquid ingredients. Stir until you have a well blended thick batter. Pour into a greased loaf pan. Sprinkle with sugar. Bake at 350 degrees for 40 minutes. Test doneness with a knife. Cool in pans on wire rack 10 minutes before removing from pans to rack to cool completely. Prepare the milk, tea mixture as done for the vegan version, but be very careful not to bring the milk to a boil too fast as it will scald and become very bitter. Preheat oven to 350 degrees. Grease 2 loaf pans and dust with flour. Beat butter, sugar, baking powder and salt in a large bowl. Slowly add the eggs. Mix in milk and vanilla until blended. (batter may look curdled) Mix in flour and poppy seeds just until the flour is incorporated. You do not want to overmix. Divide between prepared pans, spreading batter evenly. Bake 45 to 50 minutes until a knife inserted in center comes out clean. Cool in pans on wire rack 10 minutes before removing from pans to rack to cool completely. I would like to someday own my own boutique, organic, zero waste bakery in Manhattan.